I don’t get nearly enough time in the studio yet, when I do, I take time to setup shots I either dreamed about, or came up with somehow. Duplicate it in Less Than 5 Minutes!!! I would simply place the binoculars on a piece of white poster board (22 inch x 28 inch) curved either on a chair, or any floor against the wall. Essentially you are looking for a seamless curve in the posted board onto which you place your subject, in this case binoculars. Play around with the light setting to get the best shot possible, than edit with your favorite software (I use Photoshop ). I would set my Nikon on a Full Size $10 Tripod (or directly on the floor) and used this $10 Wireless Remote Control (or timer works great too!). If all I have is top mount flash, deflect light using aluminum foil (see this video I made a while back). While you’re at it keep shooing objects and turn a couple hours of stock photography work into a few hundred bucks spread out over the next couple years. 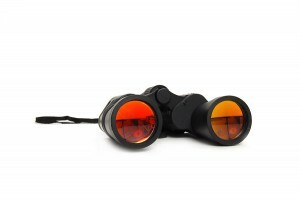 Posted in Stock Photography and tagged Binoculars Isolated, Binoculars Isolated Over White, Binoculars Isolated Over White Background, Binoculars Isolated White, Binoculars Isolated White Background, Binoculars Over White Background, Binoculars White Background.